In case you missed it, rumors spread yesterday that Artemi Panarin’s preferred destination is New York and the Rangers. That’s good stuff. I like it. It makes me excited. Since it’s the first day of September, it’s great we get to start the day with some solid Rangers rumors. As usual, I have some thoughts. 1. Panarin represents elite talent that the Rangers sorely need. We don’t know if any of the prospects will turn into Panarin, even though there is a solid chance of that happening. Either way, having too much elite talent is never a problem. Should Panarin reach free agency next year, hopefully he takes a Kevin Shattenkirk discount. 2. That last sentence is the critical one. There is no point in the Rangers trading for him. None. Zero. This is not a year they are competing, thus giving up tangible assets for him would be silly. It would be like the Knicks trading for Melo way back when. 3. Of course, that doesn’t mean Columbus shouldn’t try to trade him. If he’s not going to stay, get something for him. A contending team out west could probably use him for a last ditch Cup run. But as long as it isn’t the Rangers trading for him, we should be good. 4. Back to that elite thing, Panarin is an elite player. Panarin will be 27 at free agency next year, and he’s a point per game player. These guys don’t grow on trees. Whatever the five first round picks become, adding Panarin won’t hurt their chances of reaching their potential. There is nothing wrong with jump starting that rebuild. 5. Last thought on Panarin: I wonder how much he jump starts the rebuild. If you assume Mats Zuccarello re-signs (I’m going to assume he does, whether he is traded or not), then the magic those two can work with basically any center (Chytil?) would be something to see. Combine that with the KZB line, and you have a legitimate top-six, solid forward depth in the bottom six, and –as far as we know as of today– an elite goaltender. A lot of this depends on the growth of the kids, specifically Chytil/Andersson, but it’s worth keeping an eye on. "Some thoughts on Artemi Panarin", 5 out of 5 based on 12 ratings. Panarin is a talented hockey player and entertaining to watch .I do think he will be asking for a boat load of dough should he reach free agency. The NYR would have most of all the cash that he would be asking on deck ready to pay the man. Making room, saying bye to Zucc and most likely another top 6 winger will raise eyebrows. 1. Agreed on all counts. 3. I agree, but this is a little more uncertain. If he gets traded, he may just like his new home more than he likes Columbus. 4. Obviously true. As a backup plan, how about Mark Stone? Isn’t he in a similar situation? 5. One can only hope. I don’t see a Shattenkirk discount, more like a Brad Richards discount. The Shatty discount was for less years. Richards went the long contract but left money on the table. I remember the summer Richards signed a bunch of GMs flew out to him for their sales pitch and one GM said something to the effect of “that trip was a waste of time he’s going to New York anyway”. 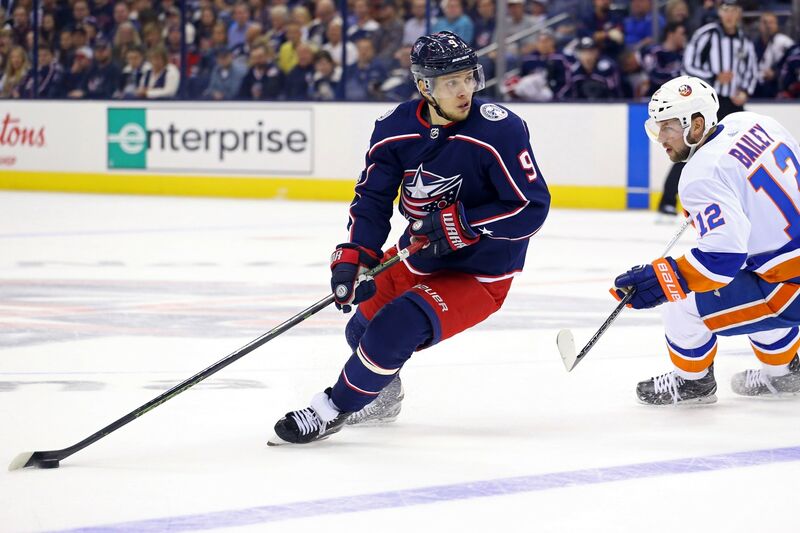 The last time we traded with Columbus we got Nash…….here we go again? I thought the plan was to build through the draft with youngsters…….and all the players we acquired for in trades when we gave up Nash, grabner, mcdonagh and miller??????????????????????????????? Make a plan, stick with it!!!!!!!!!!!!!!!!!! However, what happens if a boston or winnipeg trades for him and they have a successful playoff run,,,,,,maybe he resigns with them and forgets the rangers……MY point is if he is the man….trade for him now…..
Dave I think it’s foolish to assume that 1) The KBZ line would still be intact and 2) That one of those names from that line would still be here if they landed Panarin on Broadway. JG would have to make room for Panarin to see top line minutes with a the top PP attached to it. It’s like if Seguin signed here by next summer. What top line role and PP half wall is he going to take? Someone from the KBZ line would have to go if any of those names popped up on the Rangers doorstep. Why would the Rangers re-sign Zuccarello? His production has trended down the last few years, they’ll be plugging in Kravtsov there next season anyway. Paying him what he’d want in a bottom 6 role is a waste of resources. They can’t give him a silver stick, but they can honor him when he comes back the following season. Everyone in the tea has trended down over the last few years. Could be why the coach got fired. As much as I love Zucc, I don’t believe resigning him to a contract with any length to it to be in the team’s best interests. A short term deal at a fairly low price? Sure why not, he will put up some points and can help mold the youngsters by demonstrating the character necessary to compete at the NHL level. Otherwise, he should be a trade chip. ya just drafted kravtsov and next draft is loaded with forwards at the top but you are dead set on resigning zuc… on top of getting pannarin and drafting lias and chytil. I just don’t get it. A real headscratcher. Yes the 2019 draft looks like promising – especially for North American prospects on this side of the continent (OHL, WHL and US Hockey) – I hope JG and our scouts on this side of the pond do their homework…..